Meituan continues with strong revenue growth amidst huge losses. Chinese on-demand mammoth Meituan-Dianping has released its first interim report after its recent public debut on the Hong Kong Stock Exchange. 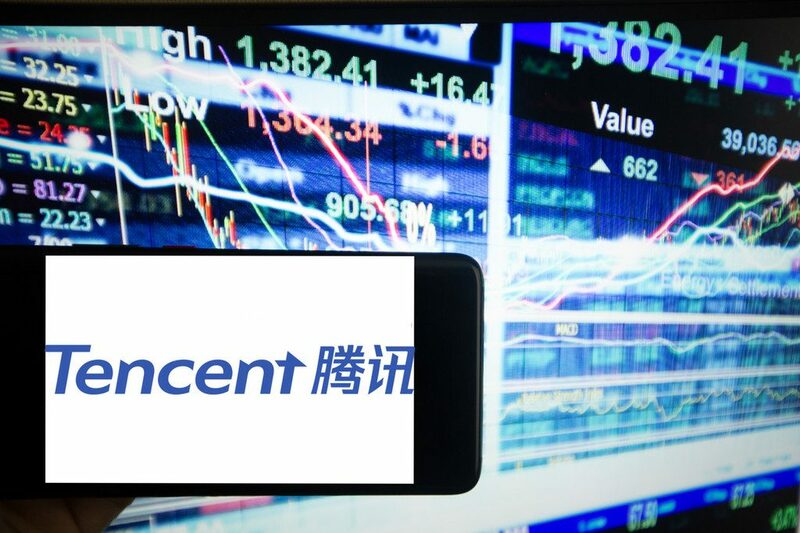 The Beijing-headquartered on-demand services company saw a 55.5% jump in its gross transaction volume (GTV), increasing from RMB 149 billion (US$21.6 billion) for the year ending H1 2017 to RMB 231.9 billion (US$33.7 billion) for the year ending H1 2018. Meituan’s annual transacting users leapfrogged from 274.6 million in June 2017 by 30% to hit a new high of 356.9 million by the first half of 2018. The above numbers tell a similar narrative and that is: swift growth in terms of transaction metrics. 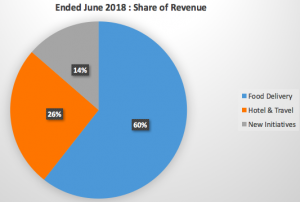 This is also reflected across the core business segments of Meituan, mainly in three broad areas food delivery, hotel & travel, and new business initiatives We’ll talk about what these are a bit further down, for now, just note the revenue collected from each of these segments grew by approximately 90.5%, 44.7%, and 422% respectively. 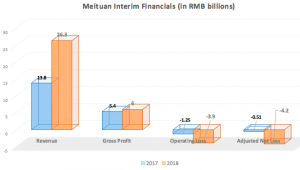 However, in terms of overall profitability, costs, and revenue, Meituan is still a loss-making firm that hasn’t seen any significant increase in its margins overall. Meituan’s revenue grew 90.6% year-on-year to RMB 26.3 billion (US$3.8 billion), but this also incurred ballooning losses. Its gross profit, on the other hand, increased only by 11.1% over the past year to RMB 6 billion ($871 million). This means, at least in the short run, it will be hard for Meituan to turn its losses into profits as the margins are very slim. While food delivery and hotel & travel business lines account for most of Meituan’s revenue, it is important to highlight that Meituan’s new business initiatives increased by 422% year-on-year. These might include Meituan’s new ride-hailing and bike-sharing offerings, which are relatively new to the platform. New business initiatives also include investments Meituan makes to expand its service offerings, mainly in the value chain of the food industry. There are signs that Meituan is starting to reap the benefits of its focus on efficiency via the use of technology. The profit margin for food delivery has widened from 9.6% in 2017 to 12.2% this year. 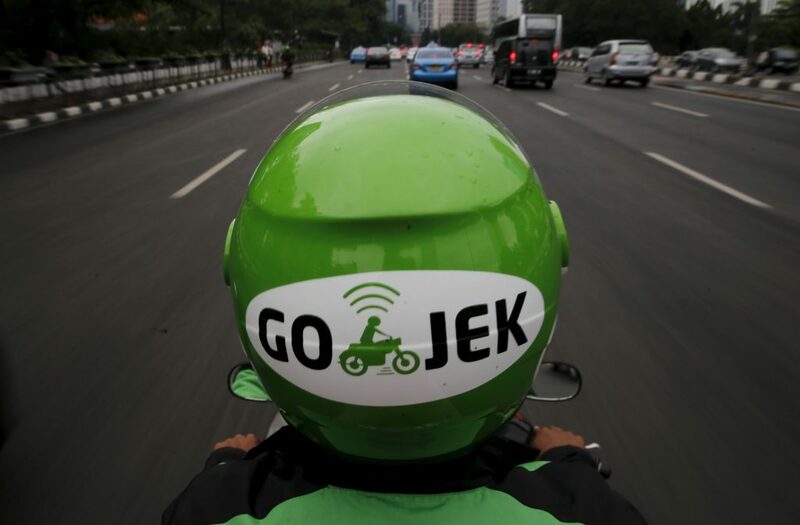 And as Meituan continues to expand its delivery network, improve its order density, its AI-powered intelligent dispatch system, the firm is set to bring down the delivery-rider-cost per order to further increase the margins for food delivery in the long run. As for the hotel & travel line of business, Meituan is seeing a 49% jump in the number of domestic hotel rooms booked from 89.4 million by the end of June 2017 to 133.5 million for the first 6 months of 2018. And the firm is also raking in more revenue from this business segment as its overall monetization rate for hotel & travel rose from 6.3% to 8.2% mainly in terms of online marketing revenue. Nevertheless, the market is still not too receptive to the huge losses and brave expansion plans of Meituan. Its share price has dipped over the past week, but it’s still the fourth largest Chinese tech company to-date.